Ravello is a very dark black brown colour which is slightly softer than true black. Ravello is our second deepest, darkest colour and has subtle hints of brown within a true black base colour which soften the natural black finish. 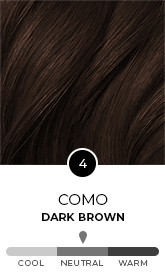 Tone: Neutral – Neutral colours are true neutrals and flatter all complexions.